This light and fresh creamy pesto pasta salad is perfect for barbecues and buffets, but it also makes a tasty main in it's own right. 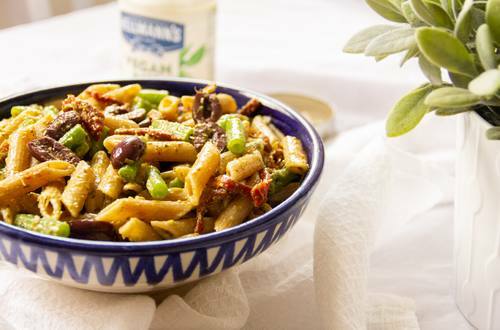 Adding the pesto and Hellmann's Vegan Mayo while the pasta is still warm allows it to soak up more flavour and keeps the texture just right. Recipe and imagery development courtesy of The Tofu Diaries. 1 Bring a large pan of water to the boil and add the pasta. Cook according to the packet, adding one minute longer than the recommended cooking time. 2 Meanwhile, bring a smaller pan of water to the boil, lower the heat and cook the green beans for around 3-4 minutes or until tender. Drain and set aside.